Vassar offers 51 majors, 29 departments, 7 interdisciplinary programs, 11 multi-disciplinary programs, and allows students to design their own course of study through the Independent Program. 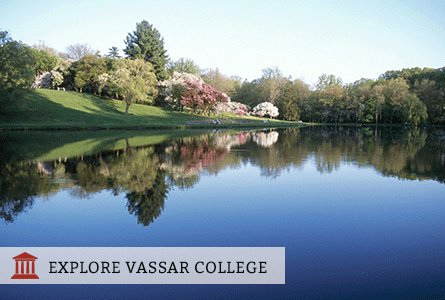 Learn more about Vassar’s programs and departments. The student-to-faculty ratio is 8:1 and the average class size is 16. Under the Vassar-Dartmouth Dual Degree Program in Engineering, Vassar students spend their junior year at Dartmouth's Thayer School of Engineering. They return to Vassar for their senior year to receive their degrees, and then have the option of returning to Dartmouth for an additional year to earn a general engineering degree. Each year, about 400 students participate in field work during the academic year with an additional 150 during the summer. Through The Ford Scholars Program and the Undergraduate Research Summer Institute (URSI), students can perform research under the guidance of faculty. The Office of Fellowships offers advising to students competing for national fellowships that fund opportunities abroad, independent research, and graduate school. Approximately 40-45% of students spend time abroad. About 20% of graduates pursue advanced degrees right after college, and 70% pursue within 5 years of graduation. Vassar's acceptance to medical schools is almost twice the national average. Among the schools students are attending are: Harvard, Columbia, Penn State, Emory, and Dartmouth. Last year, 96% of seniors who applied to law school were accepted; the national average was 78%. Among the schools students are attending are: Columbia, Georgetown, Harvard, Stanford, and NYU.